2016-2017 Training Dates To Be Announced! Please Visit Again Soon! 2016-2017 Training Dates to Be Announced! Please Visit Us Again Soon! 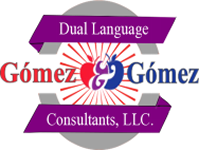 This Administrator Training will introduce the Gómez and Gómez DLE model to Education Administrators of all levels to the Academic and Linguistic strengths of our DLE model. Administrators will learn of the tie between research, instructional best practices, and other strategies that serve as the underpinnings of the highly successful G&G DLE Model. This training is especially geared to Superintendents, Associate Superintendents, C&I Directors, Coordinators, Principals, and other district administration members. This is an intensive and powerful training that brings all of the "G&G 28 Best Practices" into the lesson plans for each academic subject. This training will "connect the dots" for teachers to see the strong correlation between the 28 best practices imbedded within the G&G DLE model on a daily basis. The results of effectively implementing the skills learned in this training will be a significant increase in rigor, writing across the curriculum, paired learning, a student-centered classroom and much more. Dr. Richard Gómez Jr. will personally conduct this training. As educators move students toward being bilingual and bi-literate, it is crucial that sheltered instruction strategies be a part of the instructional methods and best practices used during the delivery of DLE lessons in both Spanish and English. Join us as we discuss strategies that will facilitate the learning process for students developing skills in two languages in G&G DLE programs AND Non-DLE classrooms. Day one: First half day, analysis of the process of sheltered instruction and the key role it plays in the DLE model and/or in an NON-DLE classroom. Second half of the day, Sheltered strategies for immediate use! Day two: What does it look like? How do I do it? Sheltered strategies among other effective methods used in DLE model and/or in a NON-DLE classrooms. This 2-Day training addresses the most asked about G&G component, our SLAR and ELAR (two language arts) 2nd – 5th grades. Consistency in Dual Language classrooms is extremely important for program effectiveness. Teachers will receive a step-by-step guidance through an entire 6-weeks of intentional and targeted Language Arts instruction. Teachers will be guided in “unpacking” the TEKS, attaining a more profound understanding of their language arts lessons. Teachers will also create a 6-weeks curriculum map and then utilize their maps to create their own lessons for two additional weeks! Participants will leave the training with a total of 8 weeks of DLE lessons! Day 1: Introduction of Language Arts Curriculum Guide 6-weeks template as well as overall explanation of the most critical factors in developing rigorous and purposeful lessons aligned to the G&G DLE Model. Teachers will also create a 6-week curriculum map for their respective grade level. Day 2: With guidance from the DLE Consultant, participants will utilize their 6-week curriculum guides created the previous day to curriculum write 2 weeks of lessons for their respective grade level. 2016-2017 Trainings to Be Announced! Please Visit Us Again!